By Michael Smith: In an effort to beef up the Dillian Whyte vs. Dereck Chisora II Sky Box Office card on December 22, promoter Eddie Hearn has added former heavyweight world title challenger Carlos Takam (35-5-1, 27 KOs) to the card at the O2 Arena in London, UK. Hearn has also signed 2012 U’S Olympian Michael Hunter to his Matchroom stable. The 31-year-old Hunter could immediately improve Hearn’s heavyweight presence in the division. Right now, Hearn has Dillian Whyte, Anthony Joshua, David Allen and Dereck Chisora. Hunter gives Hearn a future world title challenger. The 37-year-old Takam’s opponent is still to be determined. Hearn needs to do something to add at least two good fights to the Whyte vs. Chisora 2 card to give the boxing fans something to see besides just the main event. This is a Sky Box Office PPV card. The fans aren’t going to want to pay to see just the Whyte vs. Chisora II fight, and nothing else in terms of competitive fights on the card. Hearn had been hoping to match Takam against Hunter, but the American couldn’t take the fight due to an injury, according to IFL TV. That’s got to be a big disappointment for Hearn to have Hunter opting not to take the fight with Takam. It would have been a winnable fight for Hunter. Hunter beating Takam aught to increase his value for Hearn overnight if he’d taken the fight. The boxing fans are more excited at Hearn signing Hunter than they are with him adding Takam to the Whyte vs. Chisora II card. Hearn is really beefing up his Matchroom stable for his DAZN cards. Hearn has already got Anthony Joshua, Dillian Whyte, Dereck Chisora and Dave Allen. It won’t be surprising to see Allen thrown in with Takam. That wouldn’t be a fair fight for Allen, as he’s not in the same class as Takam. But Hearn has put Allen in with Whyte, Luis ‘King Kong’ Ortiz, Tony Yoka and Lenroy Thomas. Hearn won’t even let Ortiz fight Joshua, and yet he had Allen fighting him. Allen will be out of his league against Takam unless he’s lost something from his recent knockout losses to Chisora and Joshua. Hearn adding Hunter to his Matchroom stable will give him a good heavyweight to mix and match against his fighters if he’s willing to take that risk. Hunter is coming off of two good wins over Alexander Ustinov and Martin Bakole Ilunga. Hunter moved up from cruiserweight last April after losing to Oleksander Usyk by a competitive 12 round unanimous decision in April of last year. Hunter gave Usyk more problems than former IBF/WBA cruiserweight champion Murat Gassiev and former WBC champion Tony Bellew. Hunter wasn’t supposed to beat Bakole Illunga last October, but he did in stopping him in the 10th round to surprise a lot of boxing fans. It would be interesting if Hunter eventually winds up as Hearn’s #2 heavyweight behind Joshua. Hunter has the talent and the pedigree to be the #2 heavyweight in the Matchroom stable. Whether Hunter could deal with being roughed up by someone like Dillian Whyte for 12 rounds is unknown. It was smart for Hunter not to agree to the fight with Takam on short notice. Without a full camp, and dealing with an injury, it would have been too soon for Hunter to get inside the ring with an experienced pro like Takam. Hunter last fought on November 24 in stopping Alexander Ustinov in the 9th round in Monte Carlo, Monaco. Getting back in the ring just one month later to fight Takam would have been too hard for Hunter. A healthy and rested Hunter would likely be too much for Takam. Hunter might even be too good for Whyte, as long as he’s not fouled like mad. Whyte is a pretty limited fighter, but he uses his size to rough up his opponents. Takam likely won’t be matched tough for the December 22 card. There’s not going to be enough time for a good heavyweight to be found for the card. 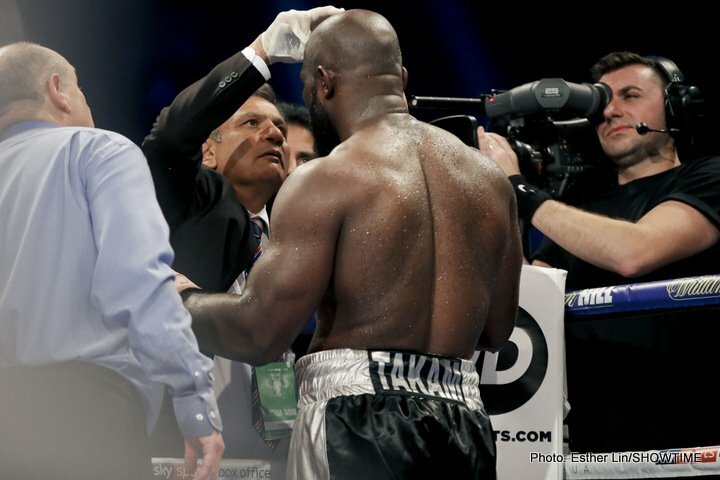 It would be tough on Takam to be put in with a lion with less than a month of training camp to prepare for the fight.